Fire is an important element of Earth system. Every year, global fires directly emit 2 Pg C (billion-ton carbon) into atmosphere, which is ~20% of total emissions from human activities. In addition to the carbon emissions, fire plumes also generate air pollutants, including ozone (O3) and fine mode aerosols (e.g., PM2.5, particulate matter less than 2.5 μm in diameter). It’s well known that these air pollutants may worsen air quality in the local and downwind regions. However, it’s not known that they also change land carbon budget by influencing photosynthesis of unburned forests. Recently, a new study in Nature Communications explored the ecological impacts of fire air pollution. Increases in O3 and aerosols have opposite impacts on plant health. O3 is phytotoxic and reduces plant photosynthesis, while aerosols may promote photosynthesis by enhancing diffuse radiation. It is unclear what’s the net impacts of these pollutants on biosphere from the same fire. 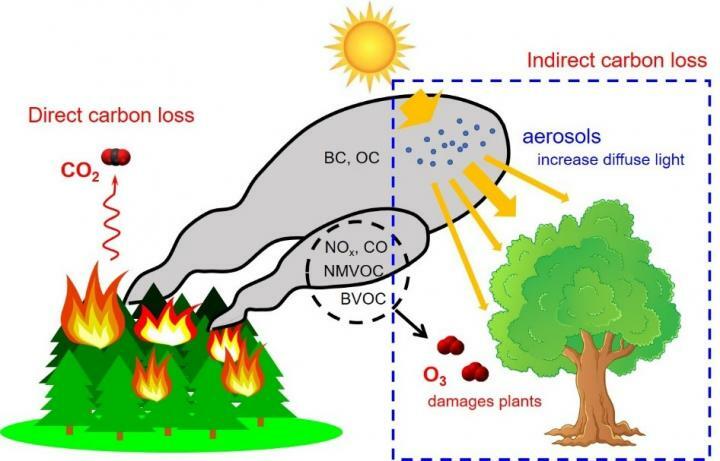 This study combined three state-of-the-art models and a full set of observations from ground sites, satellites, and literature, to quantify the net impacts of fire O3 and aerosols on gross primary productivity (GPP), a metric representing total photosynthesis of forests. Results show that surface O3 reduces global GPP by 4.9 Pg C (3.6%) every year, in which fire O3 accounts for ~20%. In contrast, global aerosols enhance annual GPP by 1.0 Pg C (0.8%) with fire contributions of only 5%. The fertilization effect of fire aerosols is very limited, likely because fire emissions usually occur in tropical forests where dense cloud masks the aerosol effects. Consequently, the net impact of fire air pollution is dominated by O3, leaving a reduction of 0.9 Pg C (0.6%) in annual GPP. Regionally, fire air pollution causes larger damages to forest productivity. For example, the 2006 large fire in Indonesia reduces local GPP by 3.6%. Furthermore, the fire pollution can cause impacts through long-range transport. We find GPP reductions of 0.6% in eastern U.S. and 0.5% in eastern China where fire events are very limited. In those regions, high level of background O3 from human activities provides such a sensitive environment that even a mild increase in O3 by fires can cause a discernable influence. This new research reveals a missing pathway of fire impacts on global carbon cycle. The damage to ecosystem productivity not only occurs in fire regimes, but also over the downwind areas through long-range transport of air pollution. “Such negative impacts may exacerbate in the future as fire activities are expected to escalate in a warming climate.” said Xu Yue, the first author of the study from Institute of Atmospheric Physics, Chinese Academy of Sciences.